I get excited about Thanksgiving dinner, but like a lot of people I also get excited for the leftovers. I don’t know why. Not everything improves with time. It’s just the idea of all those tasty dishes waiting to be revisited that’s thrilling. But let’s be honest. Thanksgiving leftovers are most exciting on Friday. But Sunday they are...not such much. 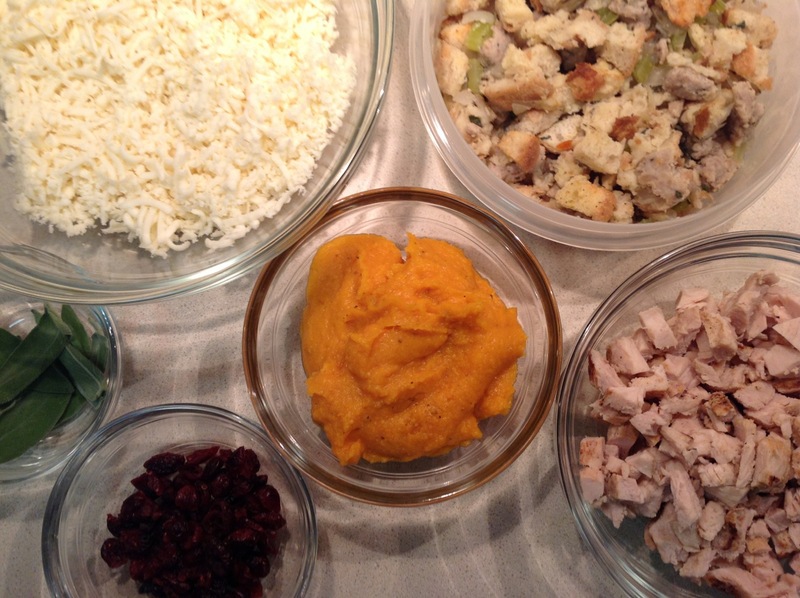 A little planning ahead, however, can save Thanksgiving leftovers from monotony by repurposing them into new dishes. In Sunday’s Washington Post Food section, there was an article with ideas about how to repurpose Thanksgiving leftovers into new dishes like Turkey and Squash Ravioli in Brown Butter-Sage Sauce and Savory Turkey and Mushroom Bread Pudding. Each of these combine a few leftovers with other ingredients to make a new dish, lending renewed life to ingredients like leftover turkey, squash and stuffing. As I was telling Chris about this story, I had a sudden brainstorm for my own repurposed leftovers dish: pizza. It was perfect. 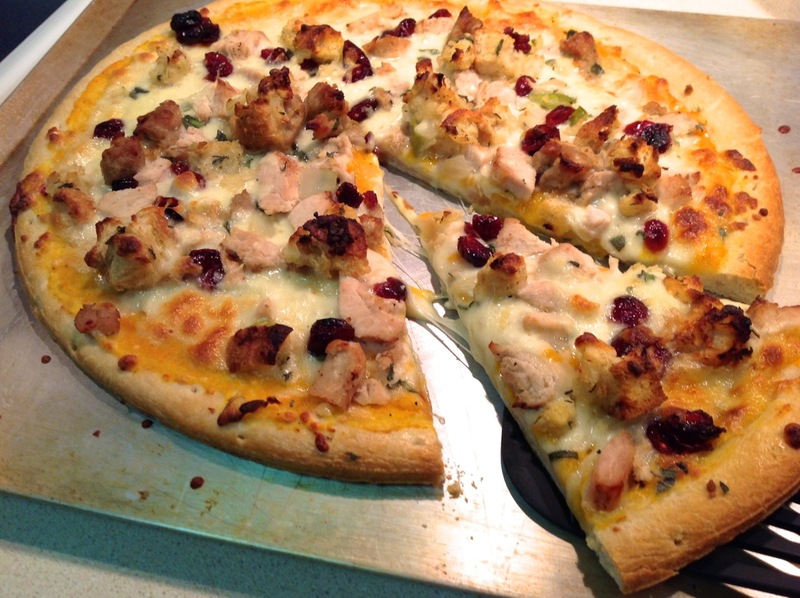 Turning Thanksgiving leftovers in pizza toppings works great. The flavors are already tailor-made to work together. After days of intensive cooking, you’ll be forgiven for using store-bought pizza dough if you don’t feel like mixing up your own. However, I do recommend roasting and pureeing your own squash if there are no squash leftovers on hand. Just 40-50 minutes in the oven at 400 F and you’ll have nicely browned squash to scoop out into the food processor with a few tablespoons of water and a sprinkle of salt and pepper until it has a smooth consistency akin to the tomato puree you’d normally put on pizza. Butternut squash is actually a rather effective substitute for tomato sauce. I use it in lasagna sometimes and it’s delicious. I also once put it in meat loaf. 1. Preheat oven to 450 F with racks positioned just above and below middle position. 2. 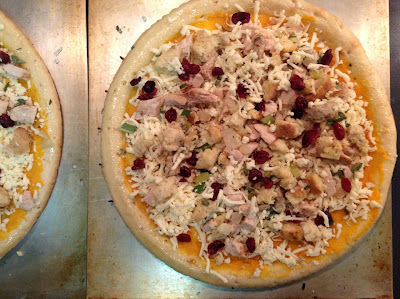 Roll out (or open package of premade) pizza dough for two 12-inch round pizzas. Place dough on separate baking sheets. 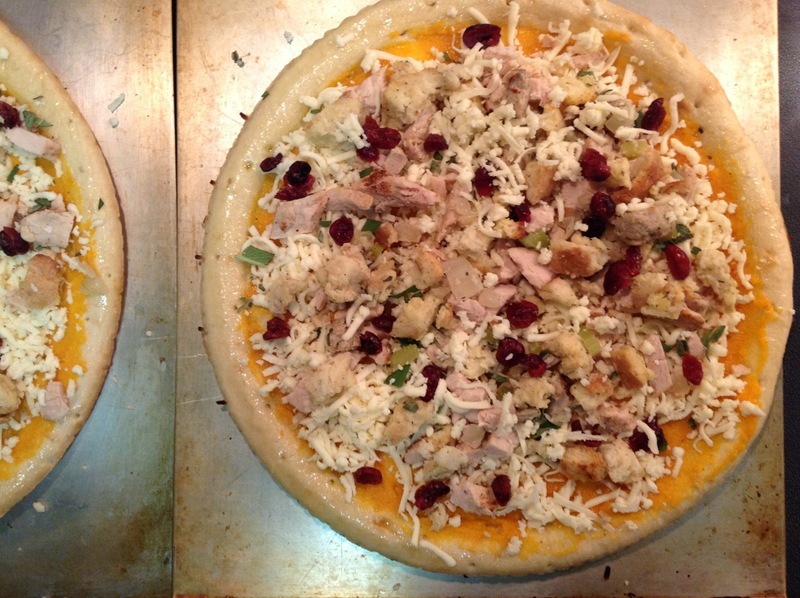 Use a spatula to smooth half the squash puree in an even layer on each pizza. Set aside about 1/4 of cheese and spread the rest evenly over the squash puree. Then add the chopped turkey, stuffing crumbles, dried cranberries and sage. Sprinkle with the remaining cheese and salt and pepper. 3. Bake in the oven until the cheese is melted, the toppings are lightly browned and the crust is browned, about 12-15 minutes. This was really good! I agree: Butternut squash makes a good substitute for tomato sauce. Who knew?! 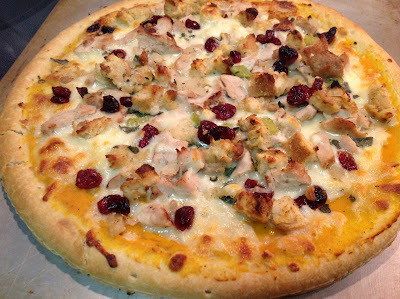 Wiseguy NY Pizza Now Open in D.C.